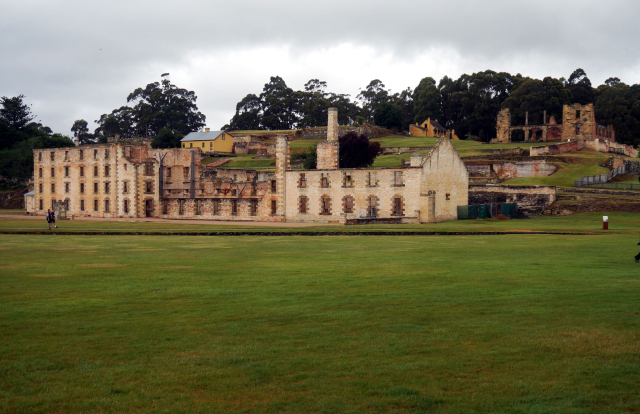 Port Arthur is only one (but the most significant) of the penal colonies in Australia. It was established in 1830 – using prisoners to harvest timber. It was closed in 1877. Sharon and I have much discussed this British system of punishment. For all intents and purposes, I view this as a concentration camp (not a extermination camp like Auschwitz-Birkenau; but like Dachau). The English Penitentiary in Pentonville, England was the model for Port Arthur – described as a “machine for grinding rogues into honest men”. The techniques used were called “discipline and punishment”. Britain’s prisons were full – so what better than to export prisoners to a faraway land where their cheap (free) labor could be put to use in empire building. The prisoners were transported chained in the holds of ships that took six to eight months to arrive. At Port Arthur, barbarous and inhumane treatment seemed the norm. The British were experienced in prisoner transport. Before the Revolutionary War put a stop to the practice, they sent prisoners to America. For me this is a huge stain on British history. It is tough to see the line between British practices and those of the Third Reich (though the British were executing “criminal justice” rather than ethnic cleansing). British prisoners built Australia. Without their labor this country might still be undeveloped.